Econet Wireless isn’t just a mobile telecoms company anymore, or rather, it’s trying hard to be more than that. A lot of its efforts have been focused on what will come beyond primary mobile communication. Which is what powered its Beyond The Phone Expo held last month. One facet of its business that was being introduced to the public there was the Econet Connected Health. 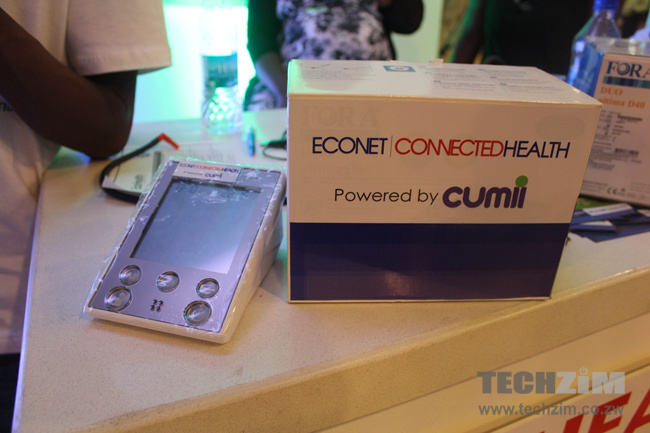 It’s wedged somewhere between the Econet Health services division which has, so far, been involved in health advisory services via the mobile phone; and the Econet Connected Services domain, called Cumii, an Internet of Things (IoT) outfit which has birthed the Connected Car and Connected Home services. 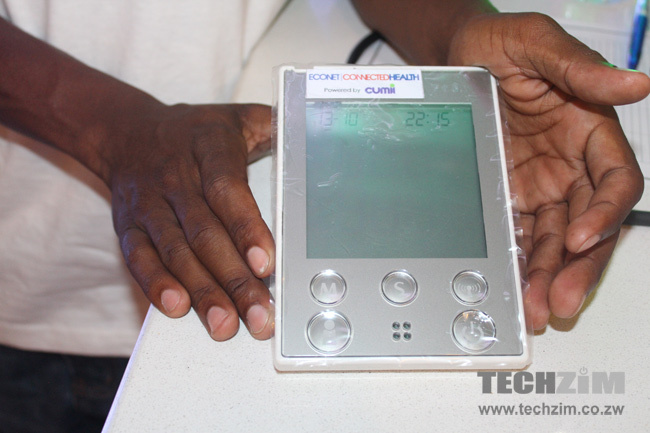 The primary device at the heart (pardon the pun) of this unit is the Econet Connected Health Device which is a blood glucose and Blood Pressure monitoring system. The device is used by patients suffering from the long list of conditions that are affected by these metrics. Beyond its primary monitoring functionality and set features that are being incorporated into every modern personal health monitoring hardware (this includes features like memory sets for readings with date and time, quick response of 5 seconds, pre and post meal records and simplified interface) the device is GPRS and Bluetooth compliant and can be linked to the internet for the transmission of results. Which is where Econet has come into the picture. Other than just providing its Econet Broadband connection, the device is also linked to a user’s Econet Health account, where the data is shared with a medical practitioner who can help monitor readings for red flags while providing a professional opinion on the condition of the patient. This effectively automates health monitoring and according to Econet, is meant to be an extension of the Telemedicine service that Econet Health introduced last year. Rather than take readings and then initiate further communication with relevant parties (the information can also be communicated to a guardian) the data is sent automatically. Econet has made this device an optional extra for its Connected Home service where it integrates with the entire domestic unit and offers a single centre that can communicate health and home alerts. The device is set for launch later this month, and has been pegged at $30 for initial purchase, with a $10 monthly premium which covers the professional medical services and costs associated with the relaying of information. 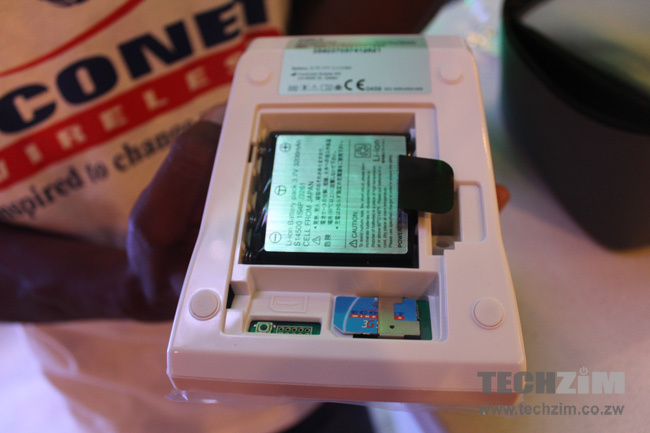 According to Econet, there has been a positive response from individuals that have been pre-ordering the unit. As the unit is simple to use and offers remote communication, it is also being targeted at the elderly and people in areas where health service centres aren’t close. From phones to health – what’s the end game though? If you are into mobile technology or controlling how its shaped in any fairly sized market, health and IoT certainly have investor appeal. But both have a stronger calling for a brand like Econet that can, with the right execution, position itself in this market as a distributor of anything that has a whiff of tech “innovation”. However there are traces of investment in aggregated data services and insurance services here. Granted big data is more of a long shot here, with the way the local market hasn’t developed a sizable appetite for it as yet. But the insurance play looks a lot clearer largely because Econet has already shown an interest in insurance services like Ecofarmer and EcoSure which was supported by Econet’s own insurance company, Econet Life. So in an Eco-verse this would be a health insurance package tailored by Steward Health, with premiums and life assurance taken care of by Econet Life, along with an EcoSure life Assurance policy for the inevitable, all under the watchful eye of health professionals through an Econet Health monitor. The 30bucks is okay for a once off fee, considering that other diabetes devices cost around 400-1000 Rands (in SA). What I dont understand is the 10buck subscription for ‘relaying’ info. Where is this info being transmitted to and how often? Is the 10bucks for data usage? With other existing devices, you sync your readings to your phone/tablet/computer and from there you can relay/transmit the info to other systems (without having to pay a recurring fee). They’re not clever that way… remember the mobile power station thing? That statement is not clear as to (1) what “professional medical services” are being offered, and (2) what “relaying of information” or where there information is being relayed to. I have more questions than answers on this one: Do you get access to a nurse/doctor? Is data free on the device? They could give you a weekly diabetes newsletter and say that is “professional medical services”. They could say your readings are stored in the cloud and charge you 10 dollars for that (whilst you can do it for free using other devices). My biggest concern is primarily data privacy. I don’t know Econet’s Security Policies enough to be comfortable with all the things they’re dabbling in. For example, tracking units for ConnectedCar are fitted via 3PP’s including individuals and companies. This poses a very high unmanageable security risk especially unit tampering or risk of electrical damage to vehicles. I wonder if security is really a concern in this IoT endavour by EW. Judging from tengai.co.zw saga, security is never a concern for Econet, just profit is what drives them. Saw the device in action at the Beyond the phone Expo and its a good innovation. It comes with the strips which the device then reads. At $10 per month, results are relayed to the doctor after every test and a doctor will call you if there are causes for concern. You also get free strips per month as part of the subscription and by the way, test strips cost way above $10 if bought elsewhere. So i would call it a good deal. Can the data be relayed to third parties such as Managed Healthcare organisations contracted to Medical Schemes( with the patient’s consent of course) who are actively managing these chronic conditions? what about those who want to use the machine for business purpose like testing BP&Diabetes ,@ a charge of course? what about those who want to use the gadget for testing BP&Diabetes @ charge of course using mobile internet?